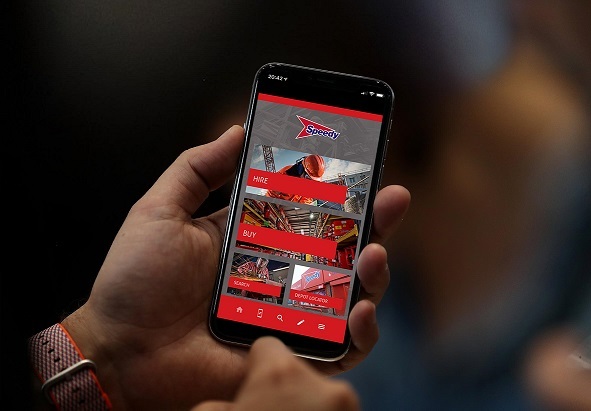 Speedy Hire, the UK’s leading provider of tools and equipment hire and services, has launched a new mobile app for customers as an extension of its digital strategy. The app makes it easier for customers to do business with Speedy by enabling them to complete a full end-to-end transaction from their mobile device. Customers are now able to view products and pricing, find a depot, hire and buy products for collection or delivery, as well as off-hiring equipment in a single click, thereby saving time and money. The app, downloadable from the Apple App Store or Google Play, enables customers to review which products are available for immediate collection from depots in their area, or alternatively order them to be delivered to their location. In addition, customers can create shortlists of frequently hired or bought items. Speedy’s industry leading service promise, Capital Commitment, where same day delivery is guaranteed on selected products if ordered by 3pm (or within 4 hours if within the M25) through same day click and deliver is also available on the app. Customers qualify for one week’s free hire if Speedy fails to deliver in the stated time. Russell Down, Chief Executive, Speedy Hire, said: “Our app was developed in response to customer feedback and we have aligned our approach to the growing requirement for immediate online access to our tools, equipment and supporting services. The app improves our service to customers and meets the growing demand for instant processing of orders and transactions. The launch of this app means that customers are now able to access our products from the palm of their hand”. “The new app is one of a range of channels through which our customers can interact with us,” adds Down. “Of course, customers are still able to call and discuss options and order products and services over the phone, or visit a depot and interact with our staff face to face. However the addition of a fully functioning mobile app allows customers choice over when and how they engage with Speedy, whilst still benefiting from our service promise”. As part of the launch, Speedy are donating 1% of every digital transaction undertaken through the app for a limited period to their charity partners; WellChild and the Lighthouse Club. The new mobile app complements Speedy’s existing digital offering which enables customers to transact online via their website. The launch is hot on the heels of the company’s recent online delivery tracker which offers customers who sign up for delivery and collection text notifications, a tracker link in their 'On Way' text. This opens up a web page and a map detailing the location of the Speedy van, the customer's site, driver details and delivery status, allowing customers’ to be better informed and improve work scheduling.